BrainStorm Cell Therapeutics (BCLI) announced today that a contract has been signed with Octane Biotech , located in Ontario, for developing a proprietary bioreactor for the production of stem cells. The bioreactor will be used for the production of BCLI's "Nurown stem cells". The joint project is also supported by a fund recently awarded by the Canada-Israel Industrial Research and Development Foundation (CIIRDF) and has been approved for a period of three years. BrainStorm is a biotechnology company developing innovative, autologous stem cell therapies for various neurodegenerative diseases such as Amyotrophic Lateral Sclerosis (ALS), Multiple Sclerosis (MS) and Parkinson’s Disease (PD). 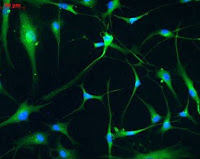 Their proprietary Nurown stem cell process used bone marrow-derived mesenchymal stem cells (MSC) to create highly specialized, neuron-supporting cells. These highly specialized cells (called “MSC-NTF”) secrete neurotrophic, or nerve-growth, factors that protect and promote neuron growth. Dr. Tim Smith , CEO of Octane Biotech, believes that their upcoming partnership will help Octane move one step closer to conducting more stem cell clinical trials. BCLI's stem cells are currently used is a Phase I/II clinical trial on patients with Amyotrophic lateral sclerosis, at the Hadassah Medical Center in Jerusalem. The company plans to expand its clinical trial in the USA. However it still awaits approval from the Food and Drug administration.